Due to embarrassment and uncertainty, men often restrain from shopping for pads. However, pads can be the best option for many. They are bulk-free and can now be purchased on online stores, stress-free. Here is our guide to the benefits of using a pad and our verdict on the top 10 male pads. Have you found the perfect pad for you? Post a question on the forum and recommend your pad. Instead of replacing your underwear with a pull up product, you can enjoy the simplicity of a pad. Simply lift them out of your underwear and stretch pants with no extra hassle! Don’t worry about the dreaded “diaper bulk”. Think more discretion than padded weight. Instead of being uncomfortable in a large product, you will forget you are even wearing protection. Shaped pads are anatomically shaped pads to provide maximum security and comfort. You can purchase shaped pads in designs for both women and men. Large shaped pads are typically used for moderate to heavy incontinence, whereas small pads are generally used for light incontinence. Some pads also feature wings, which makes fixation easier. Who are Pads Suitable for? Pads are easier to put on and take off than all in ones or pull up pants, so are recommended for those with a lack of mobility. They are also recommended for light to heavy incontinence. For very severe incontinence however, we’d recommend an all in one or pull up. 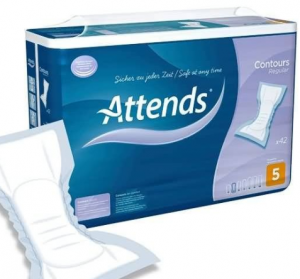 What Makes a Reliable Incontinence Pad? It is likely you will be wearing a pad for a long period of time, so looking for your ideal design is important. Ensure your pad fits securely and does not move around during use. It is essential to look for a pad that is close-fit. Choosing an anatomically shaped pad can solve this. If you have problems with your pad moving around, you can try using them with fixation pants. If you have heavy incontinence, choosing a light small pad would be ineffective. Think about more than just discretion when buying a pad. If you need a larger pad for heavy incontinence, it is better not to waste money by choosing a tiny pad. With the most absorbent level being only 11mm thick, you can’t go wrong with these pads. Although these may be more expensive than some other products, you really do get what you pay for with this option. You can choose between level 1, 2 and 3. Unlike many shaped pads, Tena Level 3 is suitable for overnight use. The secure absorption zone in the pads locks in leaks effectively. With special confioair, the pads allow skin to breathe fully whilst being protected. The popularity of this option is evident of this! Reviews of the product prove their ability to work without making the user feel trapped or uncomfortable like some bulkier pads. These pads are however super thin insert pads for light bladder weakness. For satisfaction, ensure you don’t try these for heavy incontinence. These pads are indistinguishable from other light pads, with a unique black design. These pads do not feature wings however, which would make the pads that bit more secure. 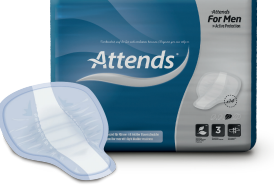 The Attends for Men pads are designed from fully breathable material, and cover needs from micturition dribbles to moderate leaks. Level 1 and 2 have an airlaid core which enables the pads to be super thin whilst providing improved leakage. Attends are a reliable brand that many of us miss out on exploring. 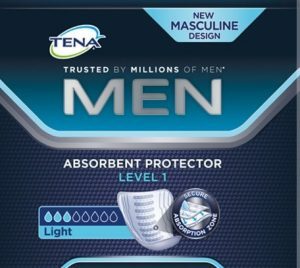 The Attends for Men range really does what it says on the label, providing pads that feel good on your skin. 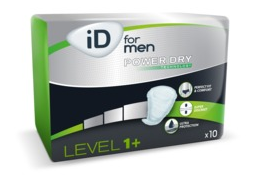 iD For Men are shaped pads with elastic gathers to ensure a secure fit. A special adhesive strip secures the pad inside your underwear so you don’t have to worry about it moving around. The pads have a soft textile back sheet that provides optimum comfort. iD for Men pads are designed with elastic and adhesive strip that secures the guard. The elastic gathers in the pads ensure a secure fit. Thin and light, the pads have a soft back sheet for complete comfort. The range offers pads for those with light to moderate incontinence. You can choose between 3 levels. 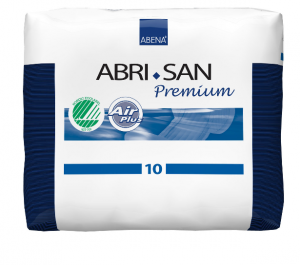 Abena Abri-Man have a micro punctured top sheet and channel systems. A frontal double Top Dry layer provides fast dispersion of the liquid. These pads are 100% breathable and are designed specially for a male's anatomy. Allanda Price Range: £2.19 to £16.83. 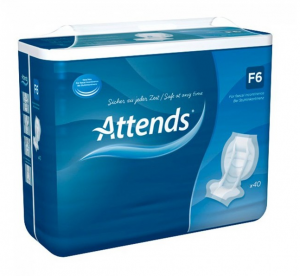 Specially designed for faecal incontinence, Attends F6 are a reliable, comfortable option. Small and discreet, the pads are not bulky and can be carried in a small pocket. With full barrier leg cuffs and a waterproof back sheet, Attends F6 are reliable and will put your mind at ease. These are perfect for men who want to manage faecal leaks without the extra bulk of an all in one. For very severe faecal incontinence, however, we recommend using an all in one design. Lille for Men are fairly small pads and are designed for light to moderate leaks. A unique Lille Air system makes them 100% breathable. They are a good choice for users with more sensitive or delicate skin. Whilst providing comfort, the pads do not provide as much absorbency or close fit in comparison to some other products. Incontinence Supermarket Price Range: £3.49- £5.12. Body shaped and thick, the pads are highly reliable for moderate to heavy leaks. Your skin will feel healthy and can breathe fully during use. The level 10 pads feature a dual core, providing the best security. The pads are body shaped, however there are different pad ranges that provide greater discretion. 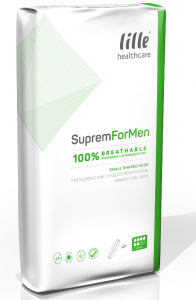 Although the brand is committed to skin health, the pads are not as close-fit or convenient as Attends for Men. The range is popular due to its large option of absorbencies and sizes, with the larger pads catering for bariatric individuals. 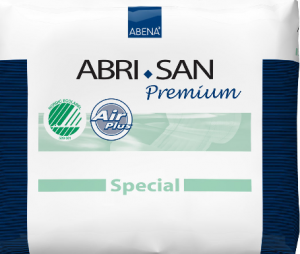 Abena Abri-San are unisex shaped pads, available in four levels. Whilst not designed especially for men, they are body shaped and provide for all degrees of incontinence. 1 to 4 feature adhesive strips, whereas wetness indicators are featured on level Premium 5 upwards. Although great for its selection of options, when looking for maximum discretion you may want to try thinner pads. For the best performance, they need to be worn with close fitting underwear only. Although the lower levels can be used for light, we recommend using these for moderate to heavy due to the product size. Allanda Price Range: £2.67 to £15.25. 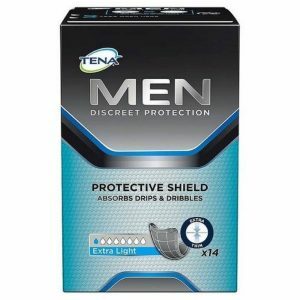 Tena Comfort are highly absorbent and reliable for men with heavier leaks. However, you need to consider your comfort needs before investing in these pads. Highly popular, they are also very thick and heavy. You will be able to feel these pads between your legs during use. People often buy these pads if they need the extra thickness to feel secure. For heavier incontinence, these pads can be a lifesaver. However, bear in mind that if discretion is your priority, these are not your best option. Are you looking for male incontinence pants? 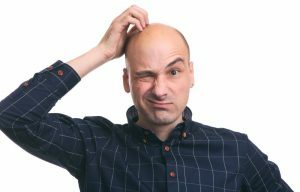 Read our guide to choosing the right male incontinence pants.